So what’s changed? There has been much controversy over the drugs we use to euthanize those sentenced to death both in Oklahoma and Texas. A new development is that the state of Texas had been disclosing to the public what drugs they use for lethal injections. That was until April, when Patricia Fleming, assistant general counsel for the TDCJ in Hunstville filed a brief asking that the TDCJ be able to keep secret the poison we shoot into the veins of those our society have deemed too dangerous and too much of a burden to keep alive. 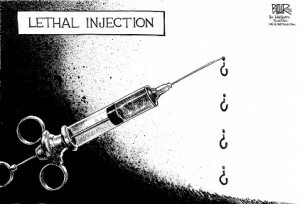 Among the arguments to keep the drugs secret are foreign bans on the drugs used for lethal injections and the potential danger of violent opposition to those distributing such drugs was posed by those that are opposed to the death penalty. Seriously? Despite which side of the debate you fall on, and you believe we should or should not still have lethal injection among the punishment for the worst of offenses in Texas, most certainly you would agree that we should at least know how we do it and what drugs are going to be used. Imagine the alternative: blind trust in the government, empowered to subject someone to the most punitive, final and irrevocable of punishments, to employ whatever noxious toxins it sees fit, so long as it doesn’t cost the taxpayers too much money. Would this not be an impermissible devolution of our society? Even those gung-hoe, ready to kill-em-all and-let-God-sort-em-out could agree, the public absolutely must know what drugs we use to kill people. Some amount of humanity and civility must be retained in a civil society. And maybe we do want Murders to pay the ultimate price. But at what social cost are willing to execute them. Are we prepared to trust the government to do it right with no one looking over their shoulder. I think not, and I hope that we don’t let this spiral even further out of control.